One of my favourite things to do is browse children’s books. I know, I’m weird. I love the illustrations, and I love how illustrators and authors work together to create the magic of worthwhile literature. 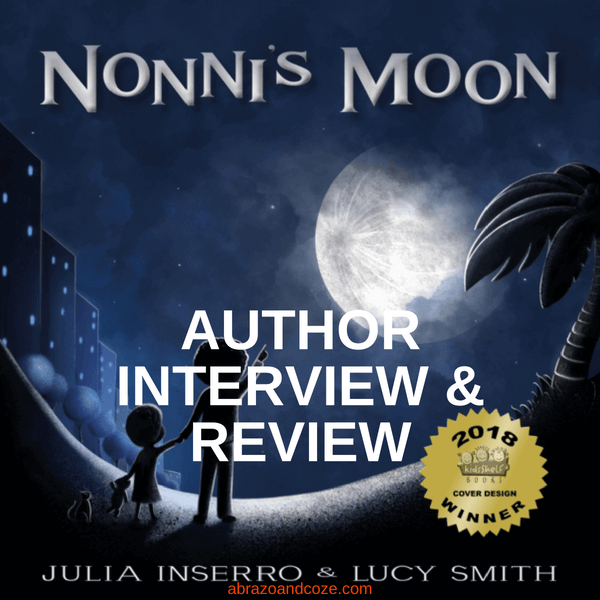 When author Julia Inserro contacted me to ask if I would review her new book, Nonni’s Moon, I didn’t hesitate to say yes. But I didn’t want to stop at just a book review. (Hello grade school memories!) That’s why I’ve decided to only review books if the author agrees to an interview. Fortunately, Julia agreed and provided some great responses to my questions. When I read books to my children, I always wonder about the author. Who are they? Why did they write this book? Have they always wanted to be a children’s author, or did they just happen to have an opportunity fall into their lap? Hopefully you get as much enjoyment from reading this interview as I had in putting it together for you. 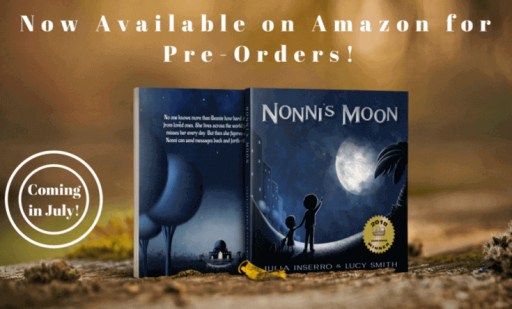 Julia Inserro is the author of Nonni’s Moon, a new picture book for kids. If your children (or you!) live far from close family or friends, this delightful story will help bridge that distance. Whatever the reason you live far from your loved ones, this poignant tale offers children a coping mechanism to deal with the emotions inherent in missing someone special. Julia masterfully writes the sweet story of Beanie, who lives on the other side of the world from her beloved and much-missed grandma, Nonni. The text, along with the enchanting illustrations by Lucy Smith, help children find another connection to those who live far away. 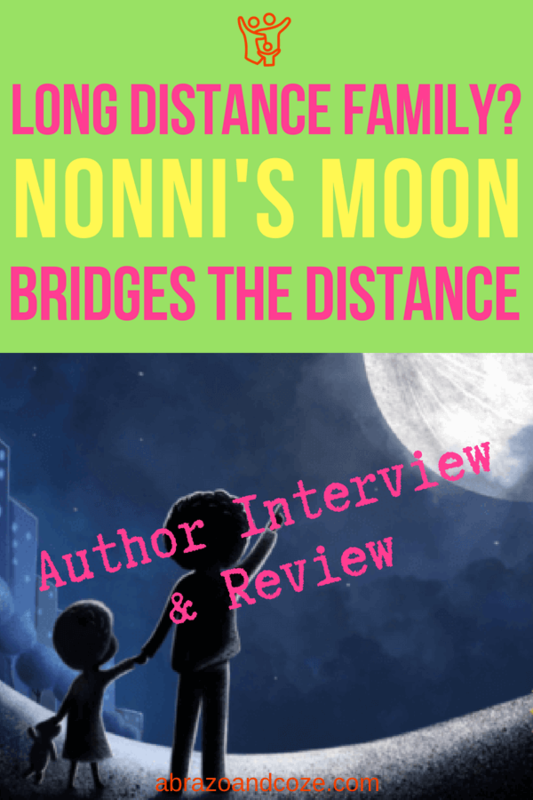 Both Beanie and Nonni dream up an unusual and special means of communicating with each other – through the moon. If your children are in the same boat, they’ll be able to relate with Beanie, and can use the same method to communicate with the people they miss most. Illustrations of a mixed white and Middle Eastern family will be relatable to multiracial families, as well as open opportunities for discussions on diversity and culture. Furthermore, children will see similarities between themselves and their family and friends, and the characters in the book. For those of us that don’t know who you are, can you introduce yourself? Absolutely. I’m Julia Inserro. I’m a mom to three kids, ages 6, 4 and 4 (well, they’ll be 4 in three weeks) and four cats. I grew up in Ohio, but six months after our wedding, my husband and I moved to Egypt and we’ve been living overseas for the last ten years. We currently live in Bahrain, a small island off the coast of Saudi Arabia. 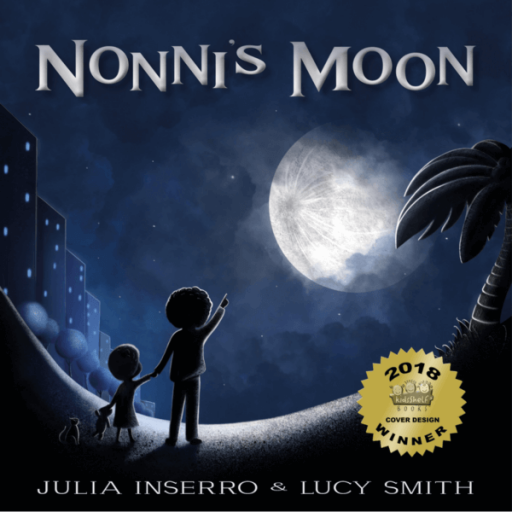 What sparked the idea for Nonni’s Moon? My mom and I are very close and talk on the phone every few days. After arriving in Bahrain almost two years ago, she said to me, “I was really missing you guys the other night. But then I looked at the moon and realized you get to see the exact same moon and it made me feel better.” I don’t think I knew it at the time, but the seed was planted. A little while later, after dropping my kids off at nursery school, I went and parked at a little public beach behind the school. That’s when I wrote out the first draft of Nonni’s Moon. It’s been through a few rounds of edits since then, but the general gist of the story has stayed the same. I’ve always been a writer of some sort, whether it was blogging (www.juliainserro.com), or writing parenting pieces, or even writing up reports for work. And I’ve always loved children’s books. Long before I had kids, I would wander the children’s sections in bookstores to see the latest best sellers. I still remember reading If You Give a Mouse a Cookie and Olivia and thinking they were brilliant. So in the back of my mind, my big dream was to write children’s books. I just didn’t know when and how it would happen. I imagine it’s hard for any author to trust an illustrator with their book. This is your first picture book, just how scared were you to put it in the hands of another artist? Finding an illustrator was a new adventure for me. I started by asking friends and tried out a few recommendations. But then I realized if I really wanted Nonni’s Moon to be taken seriously, I needed to invest in it properly. So I started reaching out to illustrators on SCBWI and various Facebook groups. When I found Lucy Smith, my amazing illustrator, we just clicked. I remember being excited to share my draft with her, maybe a little nervous that it wouldn’t resonate with her, but mostly excited. She wrote back within minutes and basically we just ran with it. Working with an illustrator you respect and trust is such an amazing experience. Nonni’s Moon was a good solid story when I wrote it. But Lucy breathed such life and energy into it with her illustrations, I was blown away. And I think that’s what a good children’s book illustrator does. I know for some traditionally published authors, they don’t get a say in the illustrations. They write the book and the publisher finds the illustrator and hands it off. I can’t imagine that. I gave Lucy a few general guidelines or preferences, and basically let her do her magic. She shared her sketches along the way and I learned so much by watching how she does her work. In my next life, I want to be an illustrator. A picture book author needs an idea of what needs to be said and what should be left to the illustrator to show, was that natural for you? It was not! I understood the general concept, of course. But I have learned so much throughout this process. If I had it to do over, I’d cut out more text and let Lucy’s illustrations “show” more. I hadn’t really grasped just how much could be told through images versus text, and how to write like that. Going forward, I’m keeping that in mind. I’ve shared my next two book drafts with Lucy and I’ve made some illustration comments on them, so I can reduce the text. Her images are so rich in detail that I can really trust her to help enhance the story. And I like getting her input and suggestions, too. For a preview of the amazing illustrations watch the trailer for the book. What were the challenges you had to encounter to complete Nonni’s Moon? Oh good grief, everything! From initially finding an illustrator, to thinking I could publish this in 10 months despite knowing nothing (it’s been about 18 months), to figuring out whether to use a print-on-demand company or printing copies myself, to truly embracing the fact that marketing will become a daily thing for me. The whole thing has been such a huge immersion class in children’s book writing/publishing/marketing that sometimes my head spins. For a while I’d been hearing about the option of using a printing company and distributing my book myself, versus using a print-on-demand company. When I got my physical proof back from the print-on-demand company, I was initially thrilled, but then started to notice that the paper quality wasn’t great, and the colors in Lucy’s illustrations weren’t as vibrant as I wanted. Just little things. Things that probably the average reader might not notice. But I did. So I fretted over it for a few days. And finally announced to my Facebook Launch Team that I was going to have to delay the release because I was switching printers. I was really worried that I’d lose the momentum we had, but they were so supportive I was overwhelmed. I definitely think it’s the right decision, despite the need for mass quantities of antacids for a few days there. As for worst advice? I honestly can’t think of any. This self-publishing journey is so much about believing in yourself, your book and your gut. If something feels wrong, you turn around and try something else. It can be a long-haul at times, but hopefully in the end it’s worth it. Oh there are thousands! From my childhood, I loved Frances the badger, by Russell and Lillian Hoban. I loved Mike Mulligan and His Steam Shovel, Corduroy, Ferdinand, Blueberries for Sal, Make Way for Ducklings. As an adult, reading to my kids now, in addition to those from my childhood I love anything by Sandra Boynton, Jamie Lee Curtis, Dr. Seuss, Jan Brett, Adam Rubin, Karma Wilson. And there are so many great books that have come out just in the last 5+ years: Rosie Revere Engineer by Andrea Beaty, The Dot by Peter Reynolds, Be Kind by Pat Miller, Chalk and Fossil by Bill Thompson, The Day the Crayons Quit, Beekle by Dan Santat, the Snowmen series by Caralyn & Mark Buehner, and Children Make Terrible Pets by Peter Brown. One of the funniest questions I’ve been asked was who should play Beanie if Nonni’s Moon became a movie. My mind went completely blank. Like black hole blank. And then all I could think of was Beanie as Lucy drew her. I mean, that’s Beanie. Beanie would play Beanie, right? Maybe I need to think bigger, but at that point that’s all I could come up with. Ha! Ideally sleeping! I have one almost-four-year-old who has rooster-like tendencies and wakes at 5:30 a.m. But at least I can get a jump on some book work, whether it’s editing, writing, or marketing, there’s always something to do. Is there anything else you would like to share with us about yourself, your writing, or Nonni’s Moon? One thing I’ve learned as others have read Nonni’s Moon is how it can resonate on different levels to different people. When I wrote it, I wrote for the family who lives far away from loved ones. But Lucy told me it spoke to her because she had just lost her father. And others have told me it spoke to them on a multicultural level. And others said it resonated for times when their spouse was deployed overseas. I think it just means that missing loved ones, in any way, is such a universal feeling. For my writing style, typically I start with a spark of a sentence or idea. My kids or husband will make a comment, or ask a question, and I’ll find myself mulling it over. Sometimes I take notes, sometimes I just let it ferment and see if it comes to the surface again. I have too many ideas, definitely, so sometimes I ask friends which ones I should focus on, or I ask Lucy if she’d prefer to illustrate a book about dinosaurs or Santa next and then focus on that one. Our next book, which has already gone through professional edits and re-writes and is in Lucy’s hands now, is about teaching children empathy; showing them how we can embrace empathy in everyday situations. It’s such an important topic to me and one that I feel needs serious attention in the world today. 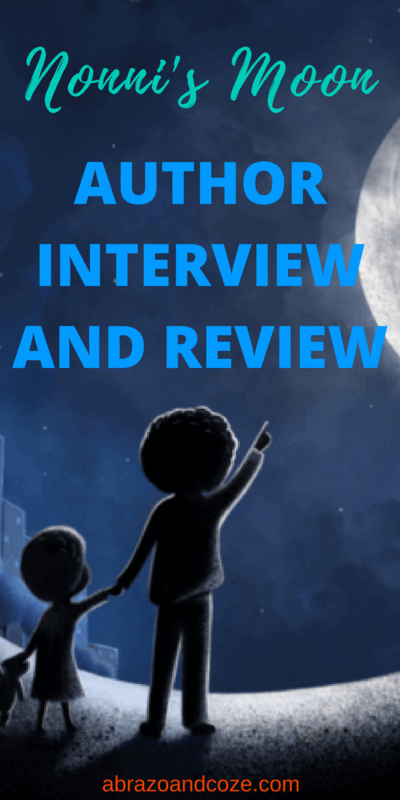 If anyone would like to see our behind-the-scenes work, you can just sign up at my website, and follow my author page on Facebook. I love being able to share the tidbits, tears, and triumphs along the way. 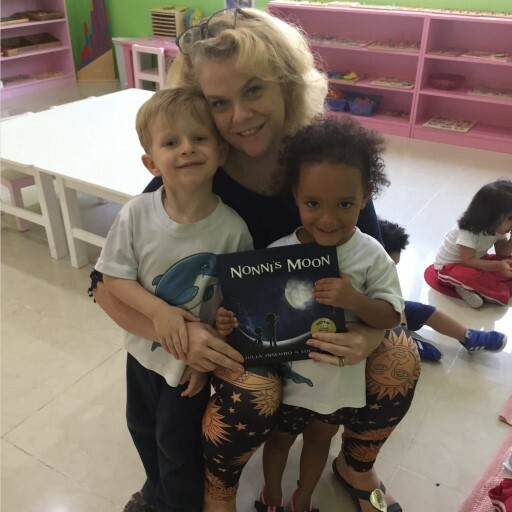 If your children are missing their loved ones, and don’t get to see them as often as they’d like, Nonni’s Moon is an excellent choice. You can order the Kindle or hardcover version (release date 31 August 2018) on Amazon. Be sure to sign up for updates from Julia on her website. 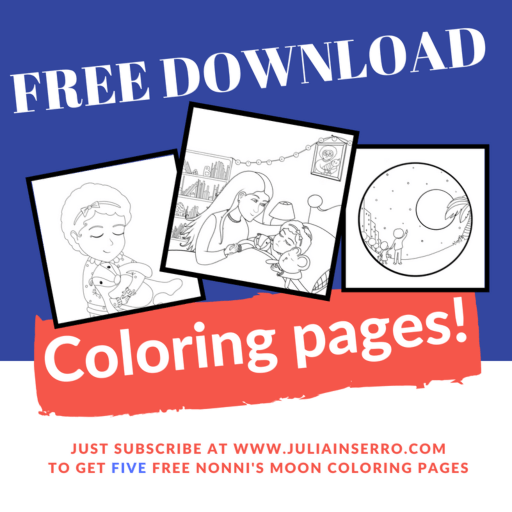 As a special gift for subscribing to her newsletter, you’ll gain access to some colouring pages for your kids. You can use them to get your darlings excited while they wait for the new story to arrive, or to colour after they’ve enjoyed it at story time. Who are your children missing? Tell me in the comments whether you’ll be buying the Kindle, paperback, or hardcover to help your children with their feelings of sorrow and longing. It really is a good book – both text and pictures together. Not much longer to wait for release! This is so sweet. I love this. Thank you for introducing me to this book! You’re quite welcome. I hope your children love it! aw, so cute book! I bet my baby will love this too and your interview went really fun based on the questions and answers! Great to see the happy faces of the kids. It really is a cute book. Kids happy about books are always great to see! I love discovering new children’s books with messages that I know will help my little one process, or learn something valuable. She’s still too young to understand, but I know we will struggle with my mom’s distance. She just moved away a year ago. I will definitely keep this book in mind to help with that! It`s always nice when we find something so useful, that is also so beautiful… a beautiful book to nurture a beautiful relationship between a child and their grandparent. This book looks awesome. Very inspiring writing your own book. It is awesome. If I were a betting person, I`d bet money on it being a big hit once the hard copies are out at the end of July. What an interesting read! My mother in law lives over in Russia so this would be an great story for my little one! It`s the perfect story for that situation! Wow! You are really awesome and your journey is amazing. I’ve been wanting to write a children’s book too but just don’t know how to get to it. You are inspiring! Definitely follow your dream. There will never be too many great children`s books. I loved the interview! Great addition to a book review and I got info on publishing if I ever try it out!